Developing a child with good habits and new learnings every day is one of the toughest jobs for the parents. Child development entails the physical, mental, emotional and other development changes that begin at birth & end at the age of adolescence. Parents often seek help from a child specialist doctor to learn about the tips and tricks for the right upbringing. Physical & mental development of children is important for their growth in the society and among their peers. Although every child is unique, development occurs in a predictable sequence. Why Physical Development is necessary? Physical development starts with the growth of a child’s body. Pediatricians recommend that children should take at least 1 hour of physical activity to grow in a healthy manner. The physical development involves gross and fine motor skills. It means that physical development comprises the ability to coordinate between the brain and the body of the child. This is the reason why pediatricians emphasize the importance of play time for children. How a Pediatrician helps in Mental development? Mental development or Intellectual development encompasses the mental processes such as learning, remembering, problem-solving, and thinking which develop from birth until adolescence. The mental development also involves the ability to interact efficiently which means that a child should be able to communicate freely. Peer pressure or being bullied at the school or park can lead to depression and stopping of growth & development in your children. If you feel that your child is behaving differently or is being unusually silent you must take him/her to a pediatrician for guidance & counseling. 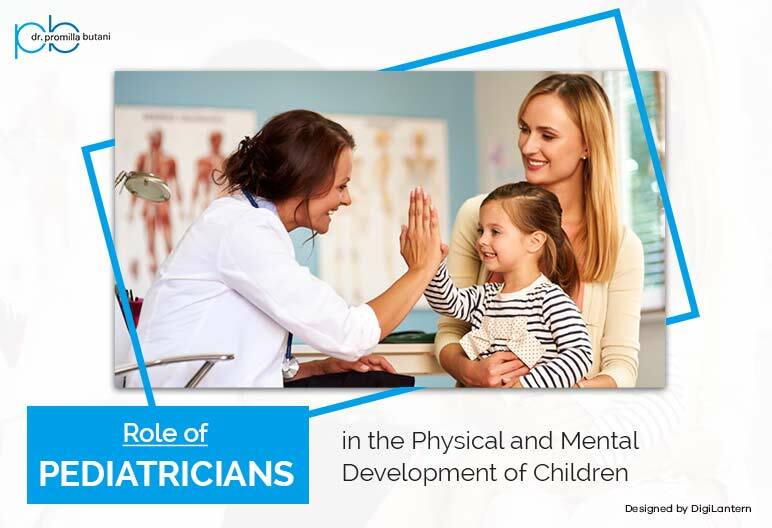 A Pediatrician or Child Specialist Doctor understands that children’s development is foremost important in the context of the family. They understand the views of the family members regarding the problem and the effect of the child’s problem on the family. Ultimately, they help the family to understand how to help their child to overcome the issues he/she is dealing with. If there are any hindrances to the child’s physical & mental development then it may lead to many problems in a child’s life. Along with the counseling of a pediatrician, it is of utmost importance for parents as well to create a safe, coherent & organized environment for their kids so that they feel happy and embrace the positive attitude towards life in general. If you need any further assistance or information about your child’s mental & physical growth you can drop your queries at info@drpromillabutani.com.